“The Birth Of Lean” published by the Lean Enterprise Institute is a terrific book. 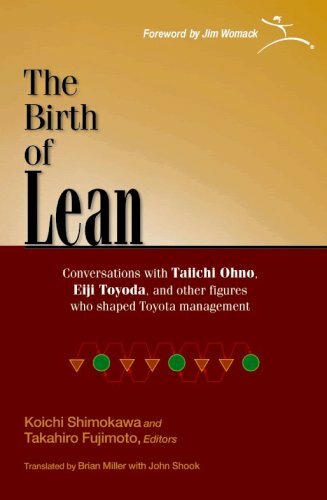 This book is for people who want to gain a deeper insight into the thinking and struggles Toyota went through to develop what we call Lean. I have been on my Lean Journey for 1.5 years. This book was perfect for someone at my stage of learning. I do not think this is a good introduction to Lean but functions as a book to help get a deeper understanding of the topics. If Lean was a college course, this would be a book for the level 300 classes. The most powerful aspect of this book was the first person narrative from TPS & TQC pioneers such as Taiichi Ohno, Masao Nemoto, and Eiji Toyoda. I felt I was able to “get into their head” for a bit and understand their thinking and perspectives. There are many gems in this book and different things that stood out to me. SCOLDING – This surprised me to see how often the speakers talk about scolding workers and showing what went wrong and why. I am not suggesting this becomes a new practice, but this really shows an approach Toyota took to creating a learning organization. Many Lean transformations strive for the feel-good approach. EXPERIMENTATION – Toyota just kept trying new things over and over again. They stopped the line and kept at it. They did not wait for a workshop. They practiced GAMBARE (just do it). TWO PILLARS – I was surprised to read that Ohno’s Toyota Production System was created almost in parallel with Nemoto’s Total Quality Control. The two systems complimented each other but were not made in conjunction. Most Lean literature has merged these two systems and call it TPS but they were independent for quite a while. If you want to think like the pioneers of Lean, this book will let you hear directly from them. There are many nuggets inside the book that will be valuable for you.